Sakai Guides and DocumentationSakai Complete User Guide Rich Text EditorWhat are some keyboard shortcuts for the Rich-Text Editor? 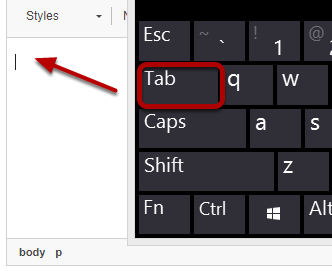 You can operate the Rich-Text Editor using a computer keyboard with the shortcuts and hotkeys below. For a full list of keyboard commands in the Rich-Text Editor, you may also refer to the CKEditor list of shortcut keys. From your course/project site, tab or arrow down into the editor's text box to place focus in the text box and edit content. When you are done, you can tab or arrow down out of the editor. Alt + 0 opens the Accessibility Instructions dialog for the Rich-Text Editor. In the example pictured above, bold text was added. Type Alt + F11 to navigate to the list of formatting elements and styles that have been used in the text where your cursor was positioned. 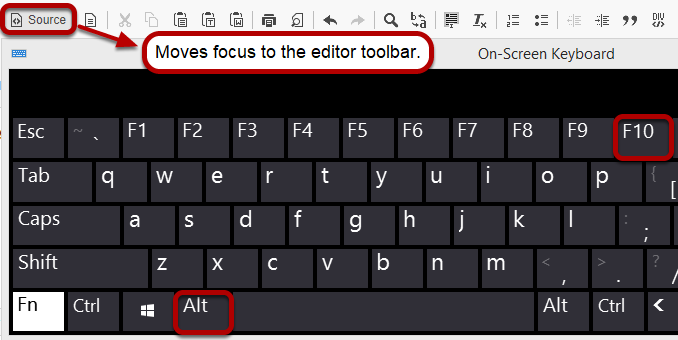 Type Alt + F10 to select the first button in the editor toolbar (i.e. Source) and begin using the toolbar. Tab and Shift + Tab – move focus forward and backward among the toolbar button groups. Enter and Space – activates a selected toolbar feature. Escape – puts the focus back to the editing area without executing any commands. Note: See the step Navigate away from the editing text box to the editor toolbar for instructions to access the toolbar from the editing window. Prev: What actions can I perform using the Rich Text Editor icons?